For other uses, see Oxbridge (disambiguation). Although both universities were founded more than eight centuries ago, the term Oxbridge is relatively recent. In William Thackeray's novel Pendennis, published in 1850, the main character attends the fictional Boniface College, Oxbridge. According to the Oxford English Dictionary, this is the first recorded instance of the word. Virginia Woolf used it, citing Thackeray, in her 1929 essay A Room of One's Own. By 1957 the term was used in the Times Educational Supplement and in Universities Quarterly by 1958. They are the two oldest universities in continuous operation in the UK. Both were founded more than 800 years ago, and continued as England's only universities until the 19th century. Between them they have educated a large number of Britain's most prominent scientists, writers, and politicians, as well as noted figures in many other fields. They have established similar institutions and facilities such as printing houses (Oxford University Press and Cambridge University Press), botanical gardens (University of Oxford Botanic Garden and Cambridge University Botanic Garden), museums (the Ashmolean and the Fitzwilliam), legal deposit libraries (the Bodleian and the Cambridge University Library), debating societies (the Oxford Union and the Cambridge Union), and notable comedy groups (The Oxford Revue and The Cambridge Footlights). Rivalry between Oxford and Cambridge also has a long history, dating back to around 1209, when Cambridge was founded by scholars taking refuge from hostile Oxford townsmen, and celebrated to this day in varsity matches such as The Boat Race. Each has a similar collegiate structure, whereby the university is a co-operative of its constituent colleges, which are responsible for supervisions/tutorials (the principal undergraduate teaching method) and pastoral care. They are the top-scoring institutions in cross-subject UK university rankings, so they are targeted by ambitious pupils, parents and schools. Entrance is extremely competitive and some schools promote themselves based on their achievement of Oxbridge offers. Combined, the two universities award over one-sixth of all English full-time research doctorates. Oxford and Cambridge have common approaches to undergraduate admissions. Until the mid-1980s, entry was typically by sitting special entrance exams. Applications must be made at least three months earlier than to other UK universities (the deadline for applications to Oxbridge is mid-October whereas the deadline for all other universities, apart from applicants for medicine, is January). Additionally, candidates may not apply to both Oxford and Cambridge in the same year, apart from a few exceptions (e.g., organ scholars). Most candidates achieve, or are predicted to achieve, outstanding results in their final school exams, and consequently interviews are usually used to check whether the course is well suited to the applicant's interests and aptitudes, and to look for evidence of self-motivation, independent thinking, academic potential and ability to learn through the tutorial system. The word Oxbridge may also be used pejoratively: as a descriptor of social class (referring to the professional classes who dominated the intake of both universities at the beginning of the twentieth century), as shorthand for an elite that "continues to dominate Britain's political and cultural establishment" and a parental attitude that "continues to see UK higher education through an Oxbridge prism", or to describe a "pressure-cooker" culture that attracts and then fails to support overachievers "who are vulnerable to a kind of self-inflicted stress that can all too often become unbearable" and high-flying state school students who find "coping with the workload very difficult in terms of balancing work and life" and "feel socially out of [their] depth". The Sutton Trust maintains that the University of Oxford and the University of Cambridge recruit disproportionately from 8 schools. They examined published admissions data from 2015 to 2017 and found that 8 schools accounted for 1,310 Oxbridge places during the three years, whereas 2,900 other schools accounted for 1,220. Other portmanteaus have been coined that extend the term Oxbridge, though none has achieved widespread recognition. The term Loxbridge (referring to the golden triangle of London, Oxford, and Cambridge) is also used, and was also adopted as the name of the Ancient History conference now known as AMPAH. Doxbridge is another example of this, referring to Durham, Oxford and Cambridge. Doxbridge was also used for an annual inter-collegiate sports tournament between some of the colleges of Durham, Oxford, Cambridge and York. Meanwhile, Woxbridge is seen in the name of the annual Woxbridge conference between the business schools of Warwick, Oxford and Cambridge. Thackeray's Pendennis, which introduced the term Oxbridge, also introduced Camford as another combination of the university names – "he was a Camford man and very nearly got the English Prize Poem" – but this term has never achieved the same degree of usage as Oxbridge. Camford was also used as the name of a fictional university city in the Sherlock Holmes story The Adventure of the Creeping Man (1923). ^ G.D. Worswick (3 May 1957). "The anatomy of Oxbridge". Times Educational Supplement. ^ G.D. Worswick (6 June 1958). "Men's Awards at Oxbridge". Times Educational Supplement. ^ A. H. Halsey (1958). "British Universities and Intellectual Life". Universities Quarterly. Turnstile Press. 12 (2): 144. Retrieved 2009-03-22. ^ Giro Koike (5 April 1995). "Why The "Cambridge & Oxford Society"?". Retrieved 2008-09-08. ^ "Oxbridge 'Elitism'" (PDF). parliament.uk. 9 June 2014. 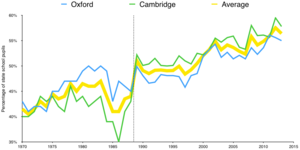 ^ "Acceptances to Oxford and Cambridge Universities by previous educational establishment". parliament.uk. ^ "A brief history of the University". ox.ac.uk. Archived from the original on 11 April 2008. Retrieved 2008-03-29. ^ "A Brief History – Early Records". cam.ac.uk. Retrieved 2008-06-27. ^ a b Cadwalladr, Carole (16 March 2008). "Education: It's the clever way to power – Part 1". The Guardian. London. Retrieved 2009-03-22. ^ Cadwalladr, Carole (16 March 2008). "Education: It's the clever way to power – Part 2". The Guardian. London. Retrieved 2009-03-22. ^ "A Brief History: Early records". University of Cambridge. Retrieved 2009-03-22. ^ Watson, Roland. "University Rankings League Table 2009". Good University Guide. London: Times Online. Retrieved 2009-02-04. ^ "University Rankings League Table". The Sunday Times University Guide. London: Times Online. Retrieved 2009-02-04. ^ Bernard Kingston (28 April 2008). "League table of UK universities". The Complete University Guide. Retrieved 2009-02-04. ^ "Research degree qualification rates". Higher Education Funding Council for England. July 2010. ^ Walford, Geoffrey (1986). Life in Public Schools. Taylor & Francis. p. 202. ISBN 978-0-416-37180-2. Retrieved 2009-02-02. ^ "UCAS Students: Important dates for your diary". Archived from the original on 1 February 2009. Retrieved 2009-02-02. 15 October 2008 Last date for receipt of applications to Oxford University, University of Cambridge and courses in medicine, dentistry and veterinary science or veterinary medicine. ^ "UCAS Students FAQs: Oxford or Cambridge". Archived from the original on 1 October 2009. Retrieved 2009-11-23. Is it possible to apply to both Oxford University and the University of Cambridge? ^ "Organ Awards Information for Prsospective Candidates" (PDF). Faculty of Music, University of Oxford. Archived from the original (PDF) on 22 August 2012. Retrieved 2009-03-22. It is possible for a candidate to enter the comparable competition at Cambridge which is scheduled at the same time of year. ^ "Cambridge Interviews: the facts" (PDF). University of Cambridge. Retrieved 2009-08-11. ^ "Interviews at Oxford". University of Oxford. Retrieved 2009-02-02. ^ Robert David Anderson (2004). European universities from the Enlightenment to 1914. OUP. p. 135. ISBN 978-0-19-820660-6. Retrieved 2009-03-22. ^ Carole Cadwalladr (16 March 2008). "Oxbridge Blues". The Guardian. ^ Eric Thomas (20 January 2004). "Down but not out". London: The Guardian. Retrieved 2009-08-28. ^ Coughlan, Sean (2018). "Oxbridge 'over-recruits from eight schools'". bbc.co.uk. BBC. Retrieved 1 March 2009. ^ Anon (2018). "The Loxbridge Triangle: Integrating the East-West Arch into the London Mega-region". talks.cam.ac.uk. University of Cambridge. ^ "Loxbridge Limited". companieshouse.gov.uk. London: Companies House. ^ Morgan, K. J. (2004). "The research assessment exercise in English universities, 2001". Higher Education. 48 (4): 461–482. doi:10.1023/B:HIGH.0000046717.11717.06. ^ "#Loxbridge hashtag". twitter.com. Twitter. ^ "AMPAH 2003: Annual Meeting of Postgraduates in Ancient History (formerly also known as LOxBridge)". Archived from the original on 11 July 2007. Retrieved 13 April 2008. ^ "Doxbridge: a chip on our collective shoulders?". Palatinate. November 6, 2014. Retrieved 2017-03-10. ^ "Debate: Rather be at Oxbridge than Doxbridge?". thetab.com. The Tab. 16 January 2016. Retrieved 2017-03-10. ^ "Is Doxbridge a thing? We asked Oxbridge students". The Tab. 2015-10-16. Retrieved 2018-09-19. ^ "The University Sports Tour for Easter 2008". Archived from the original on 2 April 2008. Retrieved 2008-04-13. ^ "Woxbridge 2011". Conference Website. Look up Oxbridge in Wiktionary, the free dictionary.